When was the last time you read ‘Fried Chicken Livers’ on a restaurant menu? It’s probably been awhile because most establishments tend to dress up the names of their dishes to entice customers into trying them. Thanks to popular restaurant menu psychology, you’re frequently being tricked into believing there is something special about a particular dish, when often it’s pretty standard fare. That’s not to say the Fried Chicken Livers aren’t delicious. But when they’re listed on the menu as ‘Great Aunt Mable’s Chicken Liver Appetizer Delites’ the customer assumes it’s a homegrown recipe handed down through the family — something only prepared for special occasions. Dollar signs are removed from the prices. Prices ending in 9 tend to signify quantity over quality, so very few high-class restaurants have prices ending in 9. More adjectives are used to describe a dish. An omelet becomes a Fluffy Light Heavenly Omelet. Even the color of the print matters. Believe it or not, there are just as many manipulative techniques used inside restaurants to get you to spend more money and less time there. 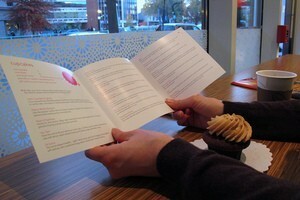 Little-Known Fact: Customers spend an average of 109 seconds reading a menu. So that’s the amount of time a restaurant has to get their message across. Little-Known Fact: When prices are listed in one of 3 ways: $20.00, 20., or twenty dollars, the center format (with neither a dollar sign nor the word dollar) yields the highest checks, with an average bump of 8.15%. Little-Known Fact: Those food items at the highest level of profit typically appear at the top and bottom of a category on the menu. Little-Known Fact: The best time to sell dessert is when the guest is hungry — before they’ve had time to eat a meal. Dessert sales increase when there’s a separate dessert menu that remains on the table. Little-Known Fact: Diners can easily be persuaded to buy based on sight, so a restaurant’s signature item or seasonal special is usually pictured in the menu to increase sales. If you want to turn the tables on the restaurants for a change, try these 10 Ways To Eat Out On A Budget. The truth is the food doesn’t have to be fancy to taste good. After all, it’s the good food that will have you returning to dine there again and again, right? All of the fancy menu psychology is meant for the first-time visitor to a particular restaurant anyway. Once you know the food is good, you’ll go back regardless of what the restaurant menu calls the fried chicken livers or how nice their menu looks!